In this age of algorithmic news feeds and self-sorting media outlets, we're more likely than ever to only hear the voices of people who agree with us. I recently started a habit of listening to podcasts I disagree with, but that make reasonable arguments for the other side. I wanted to make a platform that allows people to connect with voices that differ from their own. 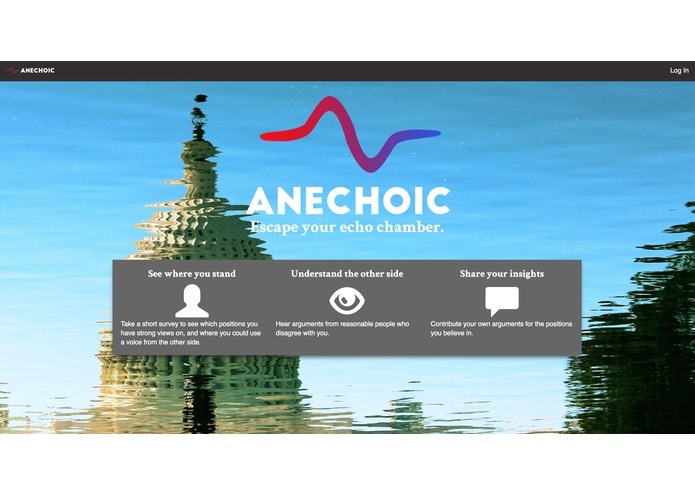 Anechoic lets you see where you stand on issues, then it shows you articles that make the case for the opposing view point. I built it using Heroku/Python/Django/SQLite. Grabbing visual previews of pages was way more difficult than I expected. I was really good at time management at this hackathon; I was careful to only work on parts I could finish, and prioritized things that made the platform better. I learned a lot about grabbing visual previews of pages. I made this. For you.